T​his Cura 3D guide for beginners shows step-by-step how to use Cura software and to find the right settings for 3D printing. Essentially that’s all Cura 3D is — print software — a way to get a digital file from your computer to the 3D printer in a format that the 3D printing hardware understands. Compare Cura 3D to other slicing software and it all seems very simple, with limited options and adjustments. But the more complex settings are there if you need them; it’s just been designed very neatly. Cura 3D is maintained by 3D printer manufacturer Ultimaker, and as we know from their hardware they’re perfectionists. Hidden (but not too deeply) in the application are almost all those settings and options that you can find in the majority of other slicing software. So if you are one of those people who likes to tinker with the settings you can. For those that just want to print, change a few quality and speed options, then in Cura 3D it’s all carefully laid out and ready to go. This tutorial is aimed at anyone just starting out with 3D printing, we’re only going to assume that you’ve switched on the printer and loaded the filament. From that point on we’re here to help guide you in the ways of Cura 3D and getting started with 3D printing. Cura 3D Tutorial: What is Cura 3D? Cura 3D is slicing software for 3D printers, it takes a 3D model and slices it into layers to create a file known as G-Code, this is the code that the a 3D printer understands. Before we look at Cura 3D there’s a little bit more to the whole print process when it comes to the 3D files and how they’re prepared. 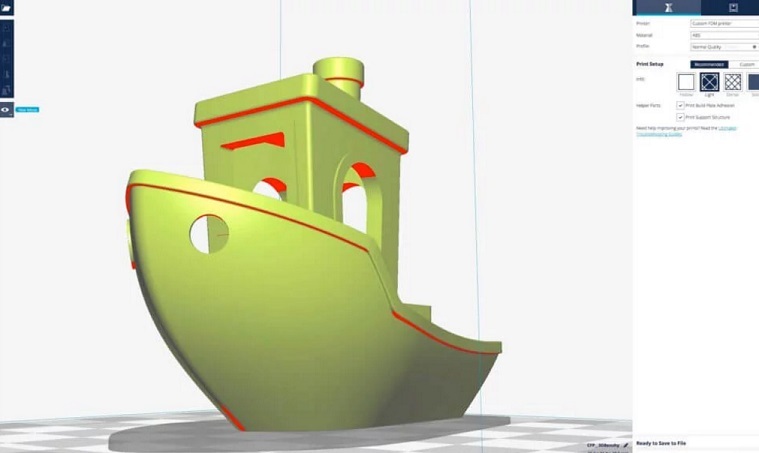 It is the process of 3D computer file to solid object that can cause confusion so it’s good to have an understanding of the process even if you don’t need to follow the first step. Modeling.This is carried out in any 3D modeling application such as 123D Design or SketchUp, as two of many example applications. These applications have their own file format and these enable you to open, edit, save and export those files from the application. 3D file export. Once you have created your model it then needs to be exported as either an STL or OBJ file. These are the file formats that are recognised by Cura 3D. They differ from the file formats that are native to the 3D modeling applications as they just hold the final geometry and not the individual primitives and editable content. Slicing file export. The STL or OBJ file can then be imported into Cura 3D where it is sliced and outputted as G-Code, this G-Code is just a text document in essence with a list of commands for the 3D printer to read and follow; such as hot-end temperature, move to the left this much, right that much etc.. 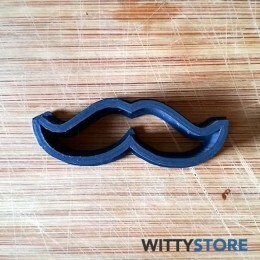 The first stage of the process requires 3D modeling, but if your modeling abilities are just in their early stages then you can pop along to Wittystore and download one of many of pre-made and print-ready models. These are usually in the STL format and ready to be imported directly into Cura 3D. Cura 3D Tutorial: What does Cura software do? Cura 3D slices 3D models. It translates the 3D STL or OBJ file into a format that the printer can understand. Fused filament fabrication (FFF) 3D printers print one layer upon another to build up the 3D object. Cura 3D takes the 3D model and works out how those layers are placed on the print bed and creates a set of instructions for the printer to follow — layer on layer. These instructions are the G-Code, a text document that ends with the file extension .gcode. Open the file and you’ll actually be able to read through quite a bit of the code and understand what it’s telling the printer to do. As you become more adept at 3D printing you can go into this code and adjust fan speeds, layer heights and hot-end temperatures at different points. This can be handy when you need to troubleshoot some 3D print problems. 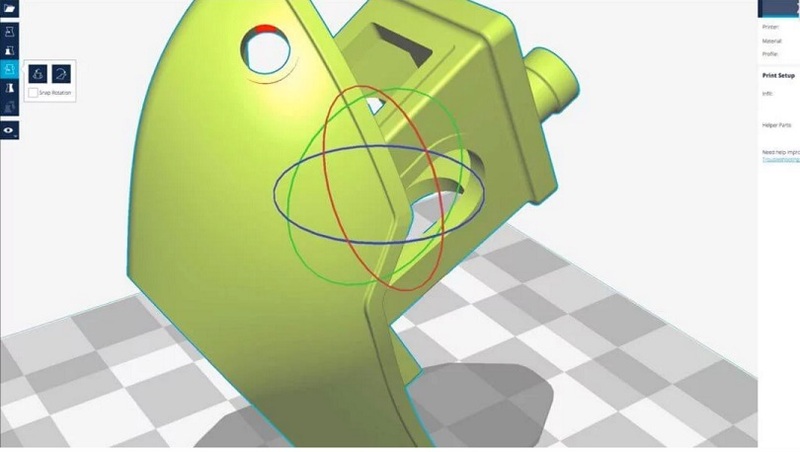 As every printer has a different setup, print area, build plate and nozzle size, the Cura 3D slicing software needs to know these hardware details in a printer profile so that it is able to calculate the exact set of instructions for your printer in order to print correctly. Once it has the printer’s vital statistics and the filament type, you can then specify layer height and thickness. The outline of your model and path the printhead needs to take in order to print your model is then calculated and a list of instructions is all saved by Cura 3D in that G-Code file. The G-Code can then be saved to an SD card or sent to the printer over wireless or cable depending on the printer. In lesson 1 you’ll discover how to get started with Cura 3D, from downloading and installing to optimizing your STL or OBJ files ready for exporting as print ready G-code files. Cura 3D is multiplatform with installers available for Linux, Mac and PC. All versions are free to download on the Ultimaker website. Get the installation file for your operating system from Ultimaker and install. In this Cura 3D tutorial we are using version 2.3.1. You’ll now be confronted with a selection of printer. For all other printers click ‘Other’ and if you’re lucky then your printer will be listed. If not, then as with the Lulzbot printers head along to the manufacturer’s website and you may find that there’s a custom version of the software ready to download. If not then select Custom and Add Printer. You’ll now be shown the Add Printer screen and here you’ll need to know a bit about your printer. Again details should be found on the manufacturer’s website, or if you built the printer yourself then you should know these details off by heart! Just enter in the settings for your printer and click finish. 1.Open file: Use the button at the top left of the interface or the ‘File > Open File’ command to open your STL or OBJ file. 2.Edit: Use to select all models on the build plate, clear models and merge models. Basic commands but useful. 3.View Mode: This button lets you switch between Solid, X-Ray and Layers. 4.Settings: From here, you open the printer-specific and material settings. 5.Extensions: One for the advanced users, this enables you to install Cura 3D Extensions that enable manual G-code editing amongst many other functions. 6.Help: Get stuck then the Cura 3D help section is the place to start. 5.Mirror. Once clicked a series of arrows will appear around the selected model, click to mirror the position of your model. 6.Select Settings. Handy features that enables you to add commonly used settings to the side bar such as wall thickness, infill and speed. These relate only to the model loaded. 7.View Mode: Solid X-Ray and Layers. If Layers is selected a slider will appear enabling you to quickly shift through the model layers. 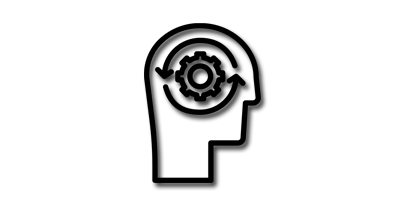 Divided into two sections accessible by the material (Printing settings) or printer (Printer settings) icon at the top. This section gives you the complete low down on the material and print quality settings. Printer. This is the printer that you selected in the first Step. If you have more than one printer then these can be setup and then selected from this dropdown. Material. Quickly select the material that your printer is using. This option is used for printers that are tethered to the machine and will not appear if your machine doesn’t have this feature. Profile. Ultimaker’s come with three print quality profiles; Low, Normal and High. These can be quickly selected from this dropdown. Once you become more familiar with the application, your printer and printing you’ll be able to create your own custom profiles that are more tuned to your style of prints and modelling. 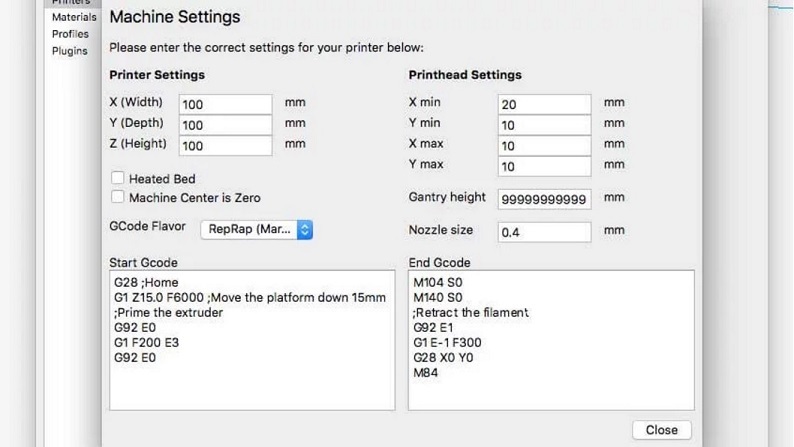 The Simple (Recommended) print options are calculated on the settings you input when initially configuring Cura 3D for your printer. This option is a great choice when you’re just starting out and even if more experienced printers can use these presets when first using a new printer just to see how the software and printer communicate. Options are limited under the Simple (Recommended) header, but you can quickly adjust the infill, plate adhesion and basic support structures. This is where the fun really starts and will enable you to adjust the print settings, from quality through to speed. We’ll look at this section and the options a little later. Now you’re familiar with the Cura 3D interface it’s time to get started and the first step is to load up a 3D file. You can either use one that you’ve created your self and exported as an STL or OBJ file or download one. 1.Click the open icon in the top left of the interface or use File > Open File and select the STL or OBJ file you want to use. 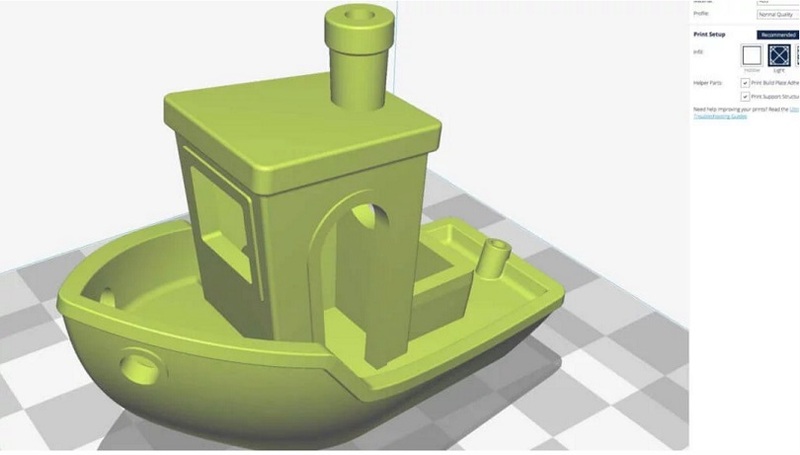 For this tutorial I’ve used 3DBenchy as it’s a great model to use when you’re testing out a new printer or software. 2.Now that the model is loaded you can take a look to see if the position is correct and without any adjustments the model will print. If all is OK then the model will be highlighted in yellow. If not it will be highlighted in grey and Cura 3D will notify you with a warning as to why the model won’t print. The first few steps are to check the print and make sure that it fits on the print platform. 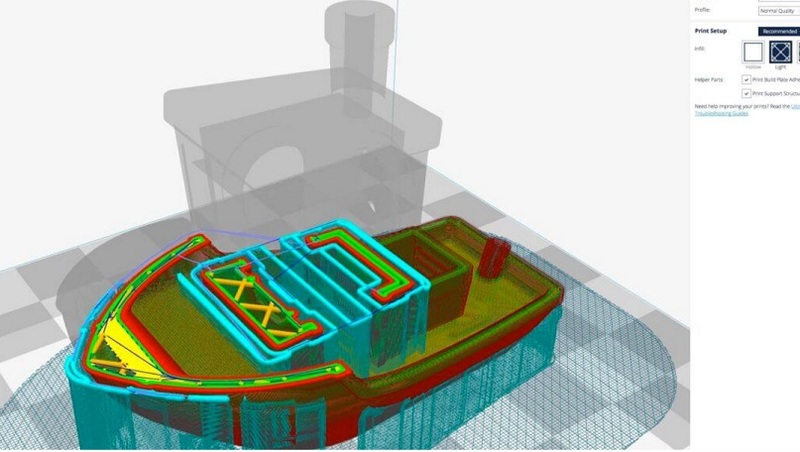 It’s also a good idea to familiarize yourself with the views and how to navigate around the window in Cura 3D. 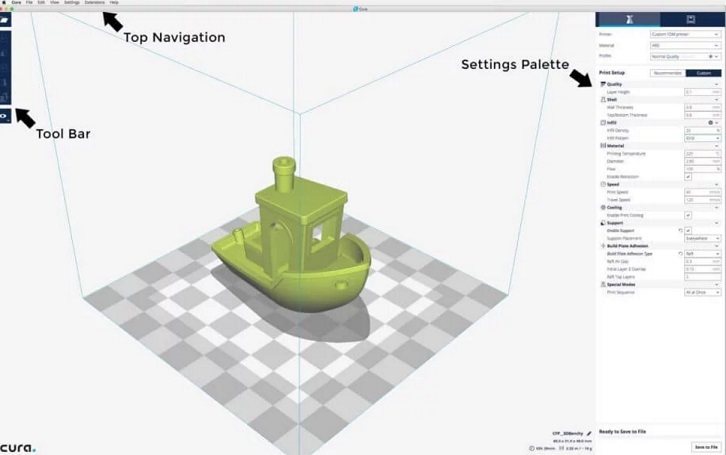 Navigate the Cura 3D build area: Hold down shift and left click to move the build area around the screen. This is often useful if you zoom into the model to check out some of the finer detail only to find that the detail you want to look at is hidden off screen due to the scale. Rotate around the Cura 3D build area: Hold down CTRL and left click to rotate around the build area. This is handy for checking the model from every angle. Zoom the build area: Use the mouse’s middle scroll wheel if you have one to zoom in and out of the model. If you don’t have a mouse with a scroll wheel I would highly recommend getting one. 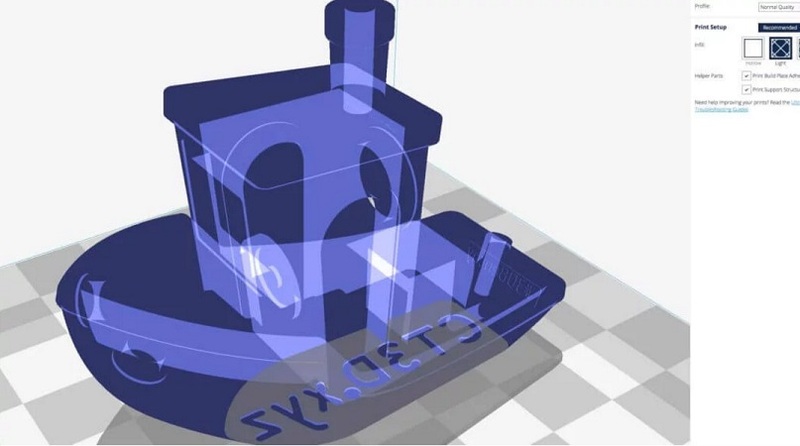 In Cura 3D there are three basic ways to view the model and each is useful for different reasons, especially when a problem arises with your prints. Solid. The default view enables you to get a good idea of how the model will look when printed. It will show you the size and shape related to the print platform. Generally if all looks OK and you’ve used the shortcuts just to navigate around the model then hopefully all will turn out just fine. X-Ray. This feature is great for when prints go wrong and quickly enables you to see parts of the internal structure of your print. Where it really comes in handy is if your print is suffering from manifold edges — edges that intersect other edges. The X-Ray enables you to see what needs to be reworked. Layers. If a print is failing every time at a certain point, or you’ve done something clever and just want to check that part of the print is OK, you can switch to Layers. An accurate way to do this is with the arrow keys, alternatively there’s a slider for quickly looking through all of the layers that build up your print. As you get more advanced with the application this feature is handy for pinpointing layers where you want to change settings in the G-code, such as increase fan speed, layer height or flow. Adjusting your model for the Cura 3D platform. If your model needs adjusting all you need to do is click on the model so that it is highlighted and then select one of the options from the tools on the left. Here you can quickly move, rotate and scale the model. When you click on any of the Tool options in Cura 3D you’ll see the arrows appear around the model. Just grab an arrow or hoop to make the change in the direction that you want. If you go wrong then you can just right click and select reset. If you want to print more than one model. With the model selected right click and select duplicate. Cura 3D will automatically reposition the models. If there’s enough space to print the two or more then all models on the platform will be yellow. If there isn’t enough space then the model out of the print area will be shaded grey. The easiest way to produce a print is to let Cura 3D handle things with the ‘Simple (Recommended)’ options. Although pretty much everything is handled for you, you can still select the quality and support options. 4.Infill. Hollow will print quickly but offers no internal support, Solid will produce the strongest model but take the most time and use the most material. Light is a good starting point. 5.Helper Parts. These are your support and Adhesion settings. If this is your first print then switch both on. As a rule if your model has plenty of contact with the print platform then switch off ‘Print Build Paste Adhesion’. If your model has no overhangs switch off ‘Print Support Structure’. The model is now print ready and all you need to do is to export the file from Cura 3D to either an SD card or send it directly to the printer. Cura 3D will now handle everything converting the 3D STL or OBJ into the G-code file required by the printer. 2.Estimate of time for 3D print. Cura 3D will give you a rough estimate on the length of time it will take for your printer to print the piece. 3.Start the 3D print. If tethered sit back and wait for the printer to fire up and start printing. If you save to SD then eject the SD card from your computer and transfer to your printer. Select print, select the file and go. Using the Simple (Recommended) Cura 3D settings is just the start and will produce fantastic prints, but as you progress you’ll need a little more flexibility over those settings. The more advanced options can be found under the Advanced (Custom) tab. Here’s a brief breakdown of what to expect. In the print settings panel on the right of the interface select Advanced (Custom). 1.Quality. This refers to Layer Height. This setting will vary depending on your printer the smaller the layer height the better the quality, alternatively increase the layer height for a faster print. Layer Height is set by default 0.1 mm for the Ultimaker 2 Extended. 2.Shell. This refers to the thickness of any walls that your model might have, as well as the thickness of the bottom and top layer. The Shell has to be an integer multiple (1x, 2x, 3x, etc.) of the nozzle diameter. A thickness setting of 0.8 mm means that walls will be 2 lines wide (as the nozzle of our Ultimaker 2 printer has a diameter of 0.4 mm). 3.Infill. Used as the support structure for your models, infill is contained within your model. The higher the density the stronger and more support your model will have. 4.Material. Not all materials are the same and sometimes needs a little fine tuning and this is the place to do it. Usually, the only option you’ll need to alter are the retraction to avoid ‘Stringing’. As a recommendation always use branded filament to avoid most common print problems. 5.Speed. This refers to the print and travel speed. Generally the slower these are the better the print. 6.Cooling. An important feature of any printer and definitely worth making sure it’s switched on. Fans generally don’t fully kick in until the 5th layer of the print has been laid down. 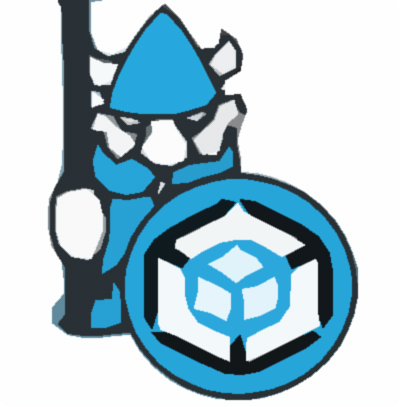 7.Support. If your model has overhangs then you need to ensure this option is switched on, you have a choice of supports everywhere or just touching the build plate. 8.Build plate Adhesion. Not all models have enough surface area to sufficiently grip to the build plate. If this is the case then using these settings will help your model adhere. 9.Special Modes. If you’re printing more than one model then this option will enable you to specify if they’re all printer together or one after the other. 1.Quality: Every printer has a maximum and minimum layer height. In this box type in the value you want for the Layer Height. 0.02mm would be high quality and require a slow print, whereas 0.6mm would be low quality and can be printed with relative speed. 2.Shell: Select the Wall thickness. A thicker wall will create a stronger print and will generally get a better finish. If using a 0.4mm nozzle then the wall thickness has to be a multiple of that; 0.4mm, 0.8mm, 1.2mm etc. 3.Top/Bottom Thickness: is again usually set to a multiple of the nozzle size. Starting at twice nozzle diameter is always a good place to start. This helps to avoid common issues such as pillowing. 1.Material. Every material has it’s own specifications and requirements and these are usually handled by the printer hardware rather than the software. The only time you should have to adjust these settings is if you are experiencing a print problem such as under extrusion. 2.Enable Retraction. In almost all cases make sure that this setting is switched on in Cura 3D. Retraction pulls filament back into the nozzle as the print head moves and helps to avoid unsightly stringing. 1.Print Speed. This is the overall speed of printing as the filament flows. The slower the speed generally the better print. You can increase the speed (the recommended is 60 mm/s). If you do increase the print speed then it’s a good idea to increase the Printing Temperature at the same time. 2.Travel Speed. This is the speed at which the head travels when not printing. On the Ultimaker 2 this is set to 120 mm/s. The travel speed is linked to the print speed and should be a multiple. This makes accelerating and decelerating smoother when changing e.g. from infill to shell printing. Infill Density. This is the amount of material that is printed as the support structure within the model. The higher the density the higher the strength. This is usually set to 20%. Enable fan Cooling. Turning off the Enable Cooling Fan setting is not recommended as it will result in warping and other ugly surface effects. 1.It’s generally a good idea to keep the Enable Support option on unless you’re sure that there are no floating or overhanging parts. 2.The Placement option determines where supports are attached: Touching Build plate means the supports are based only on the build plate; Everywhere means the support structures can also be built on the model or inside the model. Having prints that won’t stick to the print platform is a common issue and the Build Plate Adhesion is designed to enhance the adhesion of your prints by adding a Skirt, Brim or raft. Skirt: It’s always a good idea to use at least the Skirt, this is a line around the print on the first layer that just helps to prime the extruder. Brim: This is just a few additional lines attached directly to the object’s bottom to increase the surface area and also helps to minimize any effects of warping. Raft: This sits under the print and can be removed at the end. It’s a thick grid designed to maximize your prints adhesion to the print platform. Each option in Cura 3D has a variety of additional settings that enables you to tailor them to your model. Once you’ve finished tweaking the settings the model is ready to print. All that’s needed is to export the file from Cura 3D to either a card or send it directly to the printer. Cura 3D will now handle everything converting the 3D STL or OBJ into the G-code file required by the printer in the same ways as using the Simple (Recommended) settings. Cura 3D will give you a rough estimate on the length of time it will take for your printer to print the piece. If tethered sit back and wait for the printer to fire up and start printing. If you save to SD then eject the SD card from your computer and transfer to your printer. Select print, select the file and go.